Sea urchins are marine animals belonging to the Echinoidea class. They are round invertebrates covered with spikes. Their name comes from the Greek word Eckinos meaning « hedgehog ». Sea urchins appeared at the end of the Ordovician period (450 million years). Currently, there are about 1000 known sea urchin species classified in more than 70 families. Sea urchins are made of a mineral envelope more or less spherical according to the species. This protection is what is going to be fossilized in the end and shows a star pattern more or less visible. For some species, this pattern looks like a flower. It is mainly due to this pattern that the sea urchin is present in numerous legends and stories all over the world. Most of fossilized sea urchins in our catalog are from the Micraster type. This type appeared about 145 million years ago in the cretaceous period, and they disappeared about 55 million years ago in the Paleocene period. It is characterized by an egg shaped body which cut looks like a heart. You will find traces of fossilized sea urchins very early in history. They are present as offerings in tombs from the Paleolithic period to (at least) the 12th century A.C. The most famous example is Dunstable Downs in England. A tomb from the Bronze Age was discovered with two women and more than 200 fossilized sea urchins. This discovery illustrates the importance of these objects considering the difficulty to gather so many specimens. In Judea, some fossilized spikes from sea urchins (such as the balanocidaris) were found in the shape of a golf club reminding of the shape of the bladder. These spikes were then given the name of « lapis judaicus » or « the Jewish’s stone ». It was used as a treatment for urinary problems as well as for kidney stones. It seems that it was during the Crusades period that these spikes and their properties were brought to Europe. It is in Greece that you will find the oldest scientific text about urchins written by Aristotle in « the history of animals » where he described their anatomy (-343 B.C). The Celts would consider fossilized sea urchins as important snake eggs. They were the subject of a quest as important as the philosopher’s stone or the Holy Grail. These eggs were meant to be born from the convergence of energies coming from the mating of snakes during the summer. These entangled snakes would form knots such as Celtic knots. They would throw their eggs in the air thanks to strong hissings. In order to take advantage of the strength of these eggs, you had to catch them before they would fall on the ground in a jacket. According to the druids, you had to run very fast in order to flee from the snakes ‘wrath. The only way to get out of this trouble was to cross a river that would stop the snakes. You could also find snake eggs floating against the stream of the river. The eggs would be attached to gold. In order to keep their magic alive, these eggs could only be gathered at a certain phase of the moon. The owner of these eggs would then be protected against poison, toxic smokes and the defeat in a battle. It would have also allowed the owner to win lawsuits and access to the kings. The eggs would have owned the treasures and the knowledge of the world. This interest for « snake eggs » from the Celts was mainly told by Pliny the Elder who also talks about its inefficiency, particularly talking about a Roman who had been executed by the emperor in spite of wearing on as a protection. He would see in this object the origin of the caduceus surrounded by snakes used as a symbol of peace. The egg of snake is one of the most important druidic objects as it comes from the marine snake. Water was the main element from where life was born. It would go out of the belly of the female snake, the matrix, and would be impregnated by the male snake representing the vital strength. Indeed, this snake represents fertility due to its phallic shape and by coming from the earth. This is why you could find a lot of sea urchins in Celtic mounds such as in Saint-Amand sur Sèvre and Barjon. In the shire of Suffolk in England, the fossilized sea urchins (more particularly Micraster and Echinocorys) were known as « fairy breads ». They would be placed in bread ovens so that the cooking was a success. It was also said that houses which owned one of these fossilized sea urchins would never lack of bread on their tables. In the shire of Sussex in England, these fossils would receive the name of sugar bread, fairies ‘bread, shepherd’s crowns or dwarf’s hats. They would be put next to a window as a protection against thunders. It was also thought they could foretell rain. This belief has a true basis due to the fact that fossils would absorb humidity in the air. They would show mistiness on their surface. In South England, the fossil sea urchins were meant to prevent the milk from being curdled. In Malta, these fossils were considered as turtle eggs. They would also be called « the breast of Paul » due to their shape and also by the fact that they would often find two of them at the same time. In Denmark, they would be considered as thunder stones, fallen during a storm. If they were located next to a house, they would protect from thunder and witchcraft. They would have been gifts from the god Thor. They were used also to foretell storms thanks to their mistiness. In Provence in France, the fact of putting fossilized sea urchins on the roof of a farmhouse was a lucky charm. There is also a legend that says that Balthazar the wise man would have followed the nativity star to Bethlehem and would have fallen in love with a young girl. He would have then forgotten his mission. In order to remind him of his goal, God would have sent the star pattern on all the stones around him (the fossilized sea urchins). Balthazar would have then continued his mission. Around the city of Bagh in India, fossils are considered as « the stone of five » or Khada of Punchu due to the five branches star it shows. In Jamaica, the sea urchin from the Eurhodia species is known as the lucky stone. In the Swedish island of Oland, you can find Cystoid sea urchins. They are not very thick and they are almost spherical. They are filled with crystals of diagenetic calcite during their fossilization. They are called « crystal apples ». Fossil sea urchins would fight against poisoning and venom. They would strengthen the torso and its functions. It would soothe liver and digestive problems. 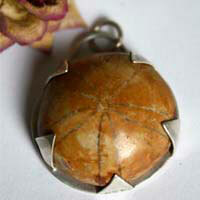 The fossilized sea urchins would relieve arthritis, muscular and articular problems. It would relieve headaches, vertigos and spasms. It would cure ear problems and calcium deficiency. The sea urchin would facilitate the absorption of vitamins A and D.